It’s summer! This colourful salad is quick and easy to prepare – the little panda pot holds the salad dressing. Heat your oven to 180C. Brush the mushrooms lightly with the oil and place on a baking tray. Combine the breadcrumbs, parsley, halloumi, garlic, lemon juice and seasonings in a bowl until well-combined. Use the mixture to stuff the mushrooms and bake for 8-10 minutes or until the halloumi is caramelised. Serve however you like – in this photo I have added a salad of cucumber and cherry tomatoes tossed with garlic, gem lettuce leaves and a lemon juice and parsley dressing. You could also use it for a bento with rice and stir fried veg. 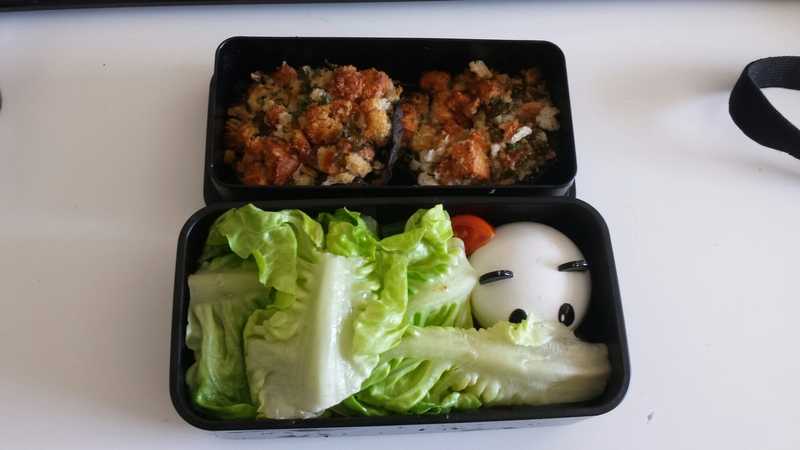 This entry was posted in Food and tagged halloumi, mushrooms, salad, vegetarian. Bookmark the permalink.